Jittery folks are afraid of things that go bump in the night. But, with night vision, they can prepare for any ghastly creature, or at least run towards the right direction. Tag Heuer moves a step closer to that coveted ability by releasing a pair of sunglasses that somehow simulates night vision – The Squadra. With it, you’ll experience better vision in dark places. Like a superspy surveying at night, your eyeballs stand to absorb more light when in a poorly illuminated area, once you wear the Squadra. The lenses are technologically crafted to minimise reflection as well as enhance contrast, improving the wearer’s vision at night. Their yellowish hue also enhances vision in the dark, as it decreases the perceptive alteration of colours. Vision in total darkness, however, is not possible. The glasses are still dependent on the amount of light absorbed by the lenses. The night vision tag isn’t only the glasses’ strong point. The Squadra, as it appears, is built for the fashionable male. 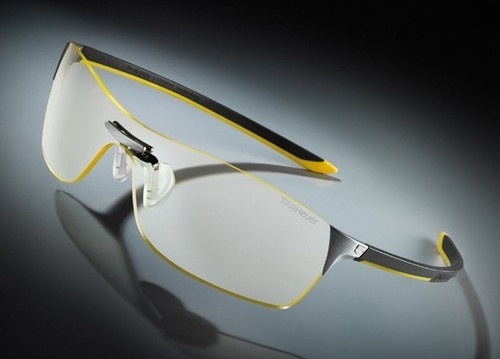 Its titanium and rubber-based frame sports sleek contours, plus a yellow and black colour scheme, which adds a dozen macho points to your wardrobe. The Squadra comes in two shapes – both of which are massively stylish. By wearing a pair, you can certainly wear your sunglasses at night. So you can. So you can.